Discover your dream, create a retreat, and renew your space. Since 1949, Fieldstone Center of Georgia has been making renovation dreams come true. Let our knowledgeable, creative, and service minded staff provide you with quality stone and masonry products for your project. There’s no other stone supplier like Fieldstone, we even own the quarry where we acquire the stone. 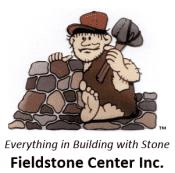 Dedication to service - Fieldstone Center, Inc. has provided superior natural stone products to the building industry since 1949. Quality and Value - It is our mission to supply quality products that are functional and beautiful, yet are also “green and sustainable building materials” that will transcend the test of time. Knowledgeable Staff - Our knowledgeable, associates are trained to provide a unique approach to meeting your needs. We’ve been a family business since 1949 and we’ll treat you like family too. Large Selection – From flagstone, fieldstone, and other building stone products to fabricated stone products, you will find what you're looking for at Fieldstone Center. The below coverage map shows our primary coverage, however we ship our product anywhere in the country. There’s no place in the United States we can’t help solve your stone needs! Call us today for a quote or visit our 24,000 square foot showroom for inspiration. We’ll answer all your questions, consult you regarding the design of your project, and make your renovation dreams come true with a beautiful stone finish.